I love focaccia, but I don’t make it often as the real Focaccia Genovese requires a few hours of resting time and I don’t always have it. I have recently shared with you the recipe for a potato based focaccia which takes a lot less time to make and today I will show you how to make an “instant focaccia”. Yes, you read that right. 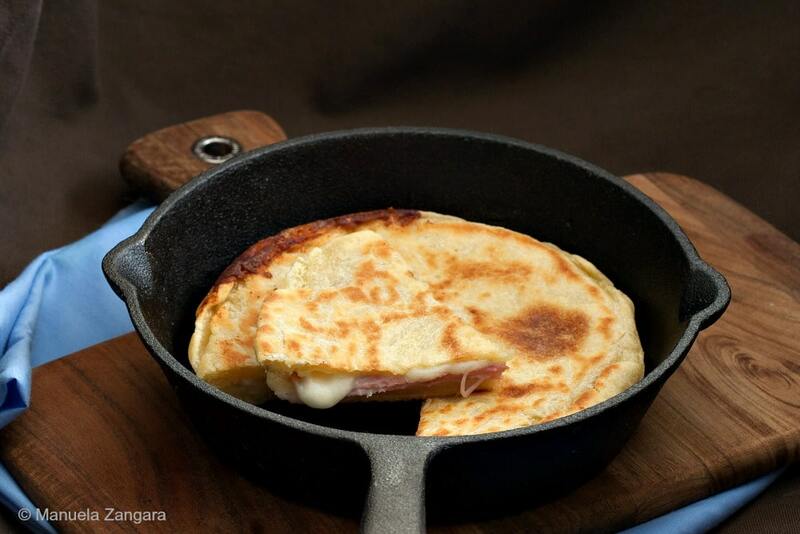 This Ham and Cheese Skillet Focaccia does comes together in a matter of minutes, as it does not require yeast. 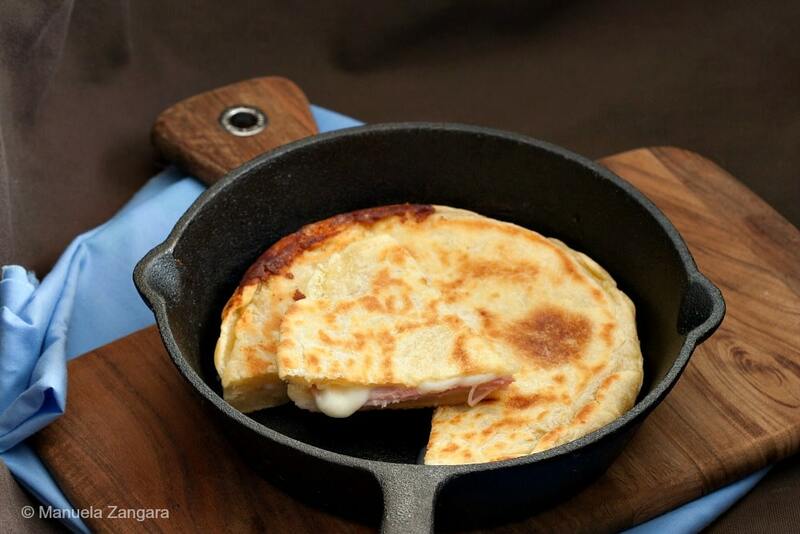 It’s not a fluffy “bread”, but because it’s filled with ham and cheese, it stays soft all the same. It makes for a quick lunch or midweek dinner idea that the whole family will love. I use durum wheat flour (the same we use to make regular pasta in Italy) for this recipe, as I like the final consistency more. If you cannot find it, use pizza or bread flour. Buon appetito! 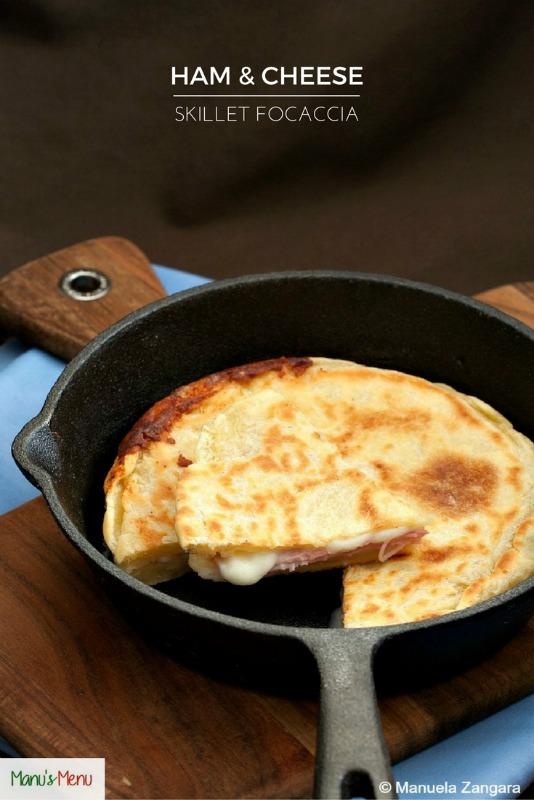 Ham and Cheese Skillet Focaccia - you won't believe how quickly this focaccia comes together! Put the durum wheat flour, water, extra virgin olive oil and salt in the bowl of an electric mixer fitted with the hook attachment and knead well. Make into a ball and divide the dough in half. Grease the skillet and keep it aside. Roll half of the dough into a 20 cm – 8 inch circle and put it in the skillet. Top with the chopped cheese and sliced ham. 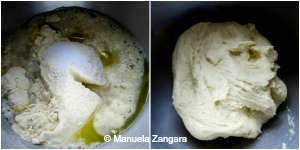 Roll the other half of the dough into a 20 cm – 8 inch circle and use it to cover the focaccia. Pinch the sides closed with your fingers. Cook on a medium flame for 15 minutes, then flip and cook for another 7 minutes, or until cooked through.